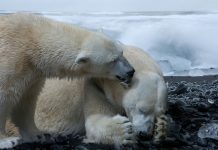 In this article you’ll get to know top 5 facts about polar bears. 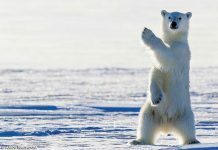 White bears have long fascinated biologists and researchers for their remarkable abilities and unique adaptations that help them surviving in the Arctic habitat. Their long distance swimming, two-layered dense fur, 35-cm wide paws, acute sense of smell, and super carnivorous nature put them at the top of food chain in the Northern Hemisphere. Now let’s take a look at these most amazing facts about polar bears. The entire population of polar bear eats up to one million seals in a single year. Seals are the most favorite polar bear prey. Prominent among the seal species are bearded seals and ringed seals which are also quite abundant in the Arctic Circle. Bears fancy eating seals because they get blubber from it—something they probably need when the food is scarce. 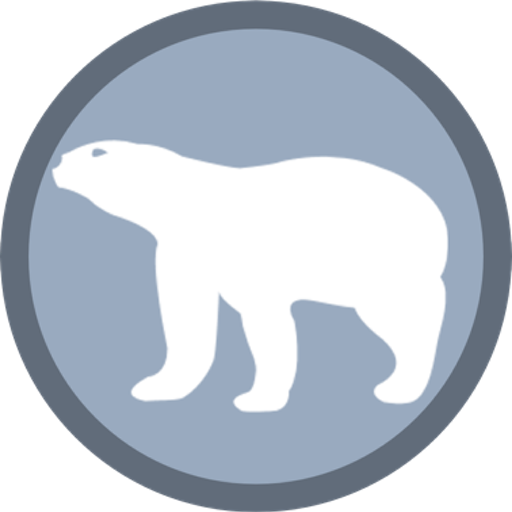 Polar bears are probably the strongest swimmers of all land mammals. 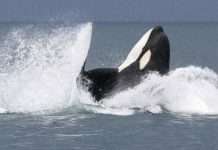 They can swim many a miles without stopping just like whales or sharks. That is why polar bears are also known as marine mammals. 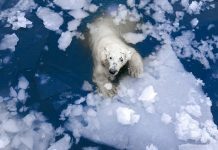 The longest swimming distance covered by a polar bear estimated at 400 miles in the Bering Sea. She swam for nine days and nine nights continuously. After making it to the sea ice she then resumed another journey of 1,100 miles. 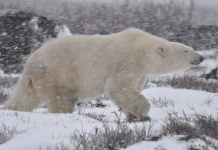 The polar bear’s skin is jet black in color which is probably in contrast to its snowy white appearance. The scientific reason behind its black skin is that the black color absorbs light more than any other color. Polar bears keep warm nearly all day long once they absorb enough sunlight. You can see its black skin when the bear suffers from some kind of disease. Polar bears are faster than the fastest human runner. Usain Bolt is the fastest human runner. Usain can achieve a speed of 27 kilometers per hour while the polar bear runs at 40 kilometers per hour. Therefore, if you happen to come across a wild polar bear you do not want to run for you can never outrun the bear. One of the best ways to escape is to move gently (not in panic!). There are no subspecies of a polar bear. 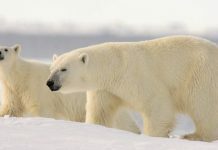 Back in 1775 when the polar bear was first described scientifically, the scientists suggested two polar bear subspecies: Ursus maritimus maritimus and Ursus maritimus marinus. However, the proposal of a separate polar bear species was rejected by the later scientists.